Oracle designed and introduced Exadata in 2008 as one of the first in the family of engineered systems. Unlike traditional database systems, which are configured, installed, tuned, and managed by a user, an engineered system has all the necessary components like OS, database, memory, and storage preinstalled, configured, tuned, and optimized by the solution provider, such as Oracle. Database servers: Enterprise-class servers that run database software, Automatic Storage Management (ASM), or the Oracle Grid Infrastructure. Storage servers: Storage servers, or cells, that run Exadata storage server software, which manages I/O requests coming from database servers and requests for data returned to a user. InfiniBand network: The internal Exadata network is built on InfiniBand, which is primarily designed for high-performance computing environments. Exadata comes with software known as the Exadata Storage Software (ESS), which enhances the performance of a database. ESS, the storage management server installed on each storage cell, manages the storage servers and communicates with database servers for any storage-related requests. Flash cache: The Flash cache is a high-performance cache on cell servers that caches recently accessed objects. Flash log: The Flash log provides a high-performance, low-latency, and reliable temporary store for redo-log writes. EHCC: Exadata Hybrid Columnar Compression (EHCC) enables the highest levels of data compression. EHCC organizes data into sets of rows called compression units. Within a compression unit, EHCC organizes the data by column and then compresses the data. Storage indexes: Storage indexes are in-memory structures on the storage servers that are designed to reduce the time spent reading data from a disk on the storage servers. 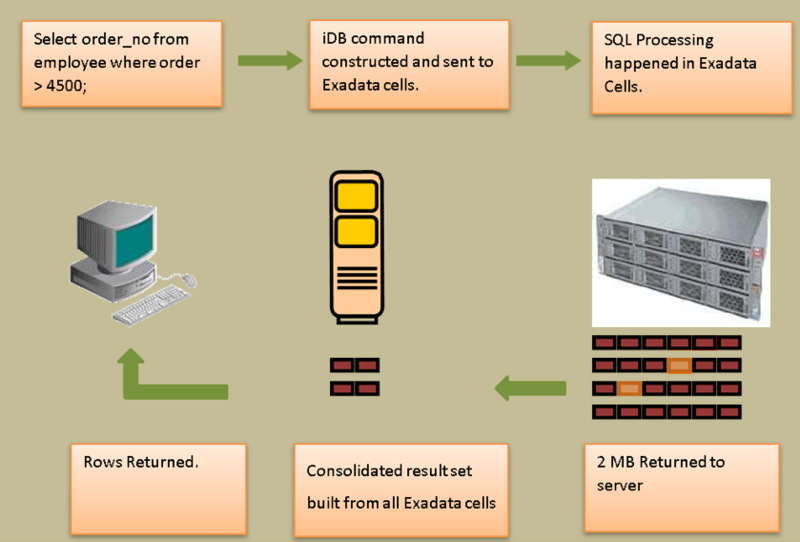 Cell offloading: Unlike traditional storage design, the Exadata storage cells are designed to process some workload internally to reduce the overall burden on the compute or database nodes. This process is called cell offloading. Smart Scan: Smart Scan allows most of the SQL processing to happen in the storage tier instead of the database tier, which dramatically improves query performance. Smart Scan reduces the volume of data sent to the database tier thereby reducing CPU usage on database nodes. 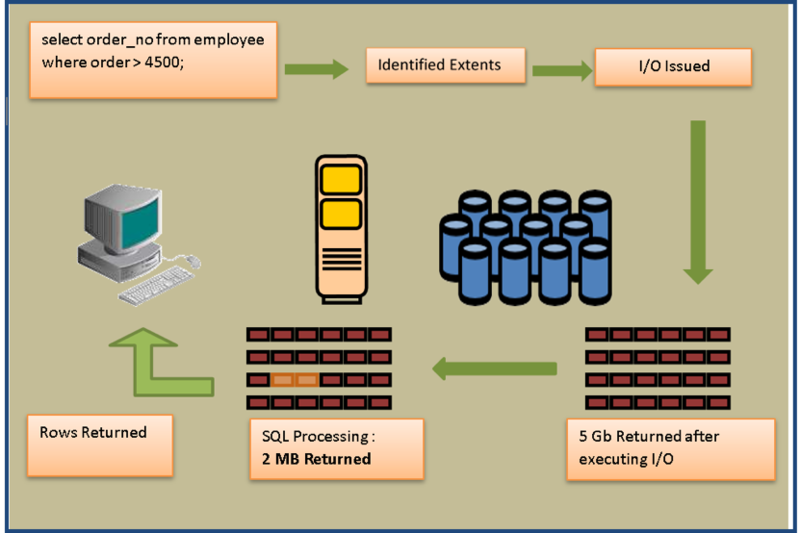 Traditionally, SQL processing happens on database servers only. In Exadata, SQL processing is divided and also takes place on the storage tier. A client submits a query. This action triggers a full table scan. The database maps the request to the file and corresponding extents, which contain the table being scanned. Similar to a full scan, the database issues the I/O operations to read all the blocks. All the queried blocks of the table are read into memory. The process searches the blocks for the rows that satisfy the predicate. Lastly, the requested rows are returned to the client. If it is a big table, all the blocks from that table are read, transferred across the storage network, and copied into memory. The process reads many unwanted rows are read into memory to complete the requested SQL operation. The large volume of transmitted data consumes bandwidth, impacts response time, and creates an unnecessary burden on the database tier. The database server constructs an Intelligent Database (iDB) message, which includes the query criteria. This iDB message goes to all storage servers in a rack. The cellsrv component of the ESS scans the data blocks to identify the matching rows and columns that satisfy the request. Every storage server executes the query criteria in parallel and sends only the relevant rows, or the net result, to the database server by using interconnect. The database consolidates the result and returns the rows to the client. You can use Smart Scan for only full table scans or full index scans. Queries must perform direct-path reads. You must set the database initialization parameter CELL_OFFLOAD_PROCESSING to TRUE. You must save segments in disk groups that are completely stored on Exadata cells. Execute the following steps, first with and then without Smart Scan enabled, to measure the Smart Scan effect on the statistics. Run the following command to verify statistics again. Note that all the data processed by the query in step 3 (physical read total bytes) is returned to the database server over the storage network (cell physical IO interconnect bytes). Run the following query to verify the statistics. Note that the query still performs approximately 759 MB of I/O (physical read total bytes) as in step 4. However, this time only 1.7 MB is returned to the DB server (cell physical IO interconnect bytes). This is the result of a Smart Scan in action. In this case, Smart Scan is acting on I/O associated with this query because the cell physical IO bytes that are eligible for predicate offload equals the physical read total bytes, and the cell physical IO interconnect bytes returned by smart scan equals the cell physical IO interconnect bytes. The Smart Scan feature in Exadata enables SQL processing to happen at the storage tier, instead of the database tier, to improve query performance. Smart Scan reduces the volume of data sent to the database tier thereby reducing the CPU usage on database nodes.